Learning the lingo used in the United States can be hard enough for a native speaker, but it’s even more daunting for immigrants. Jimmy Gyasi Boateng, a native of Ghana, has been living in the US since 1978—long enough to successfully adapt to life in a new place. Determining how to use vocabulary has been critical to his success. Learn how to use certain words and phrases and overcome problems that confront many speakers of English as a second language with this guidebook. • decipher hidden meanings behind certain words and phrases. You can find out exactly what people are saying and know how you can join the conversation. By understanding the language and employing it properly, you can start down a path that leads to success. 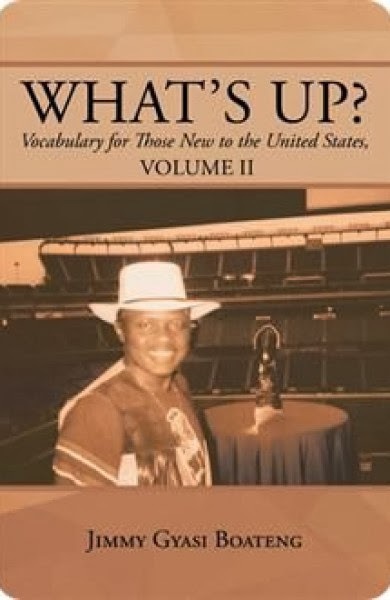 Be yourself while discovering how to relate to new people in a new environment through What’s Up? Jimmy Gyasi Boateng, a native of Ghana, served in that country’s parliament for ten years before going to work as a librarian at the State Insurance Corporation of Ghana. He moved to the United States in 1978 and has worked for numerous employers, including serving as an interpreter for the Massachusetts judiciary. He graduated from Rhode Island Trade Shops School earning a diploma in culinary arts as well as a certificate from the New England Gerontology Academy. He has been voted three times to the board of trustees for the American Amalgamated Clothing and Textile Workers Union Local—1832T. Pump Up Your Book and Jimmy are teaming up to give you a chance to win a $25 Amazon Gift Card!